"Because the number of eggs allowed is not large (1-2/3 dozen)...most of the eggs purchased are used in puddings, baked products, and main dishes (like today's lunch). Since the eggs are used in cookery, they may be Grade B or C quality." I like celery tops in soup too. I usually freeze mine and although the colors darken it matters not once they're cooked. I have been chopping up our celery leaves and adding them to our salads. 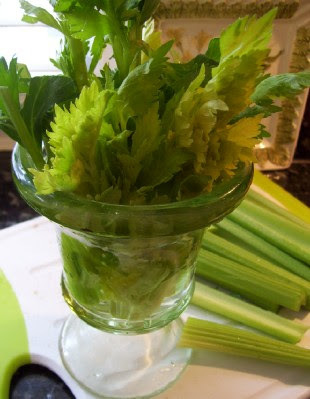 I love the celery top bouquet! How creative! I never would have thought of displaying the celery tops, but they are pretty. Meredith, celery leaves are so underutilized. I saute them with my aromatics in chicken dishes and even in salmon patties. They are a great substitute for Italian parsley!